Product prices and availability are accurate as of 2019-04-16 16:09:16 UTC and are subject to change. Any price and availability information displayed on http://www.amazon.com/ at the time of purchase will apply to the purchase of this product. 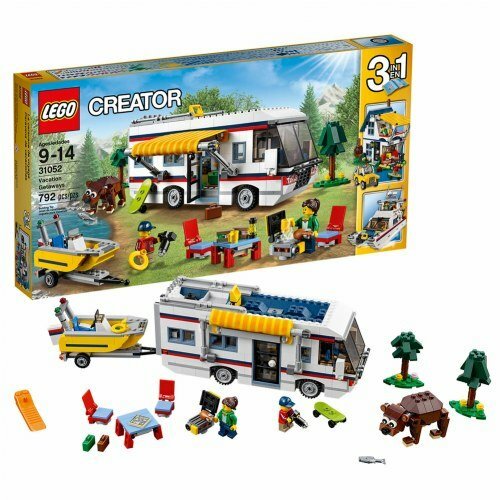 Relax and chill out with this new 3 in 1 Lego Creator Vacation Getaways set. The main build is a stunning RV camper vehicle but you can also build a Yacht or a holiday home. While the camper van steals the show as the best build out of the three, you might prefer the boat or vacation home. 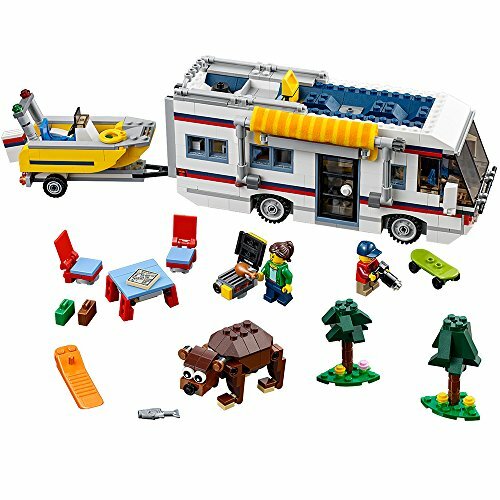 Who Would Buy The Lego Creator Vacation Getaways? Lego market this set as age appropriate for 8-12 year olds, but there are a lot of older Lego fans who would appreciate this beautiful set. 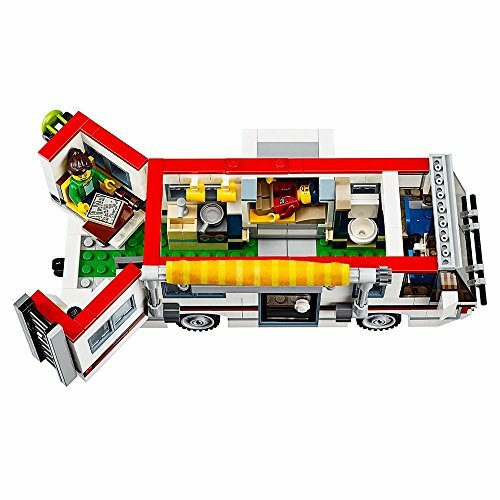 We'd say it is suitable for Lego enthusiasts; a great project for all the family or for someone who loves RV's and wants a nice looking display model. This 750+ piece Lego Creator set is a bit more challenging than most and we are always happy to take on a challenge! There are lots of great detail including 2 mini-figures - a Mother and Son and a little brown bear. You can remove the roof of the camper van to expose the interior. Inside are a toilet, bed, kitchen area, sofa and television. There are also barbecue accessories, maps and suitcases. 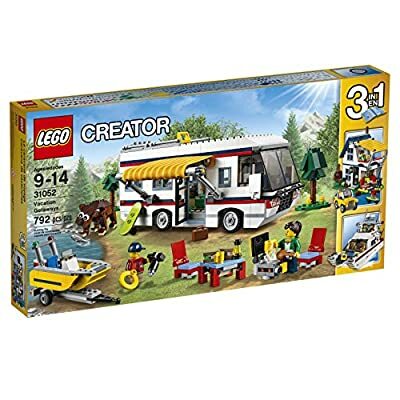 The camper van also tows a trailer and motorboat and there is a striped yellow canvas awning that doubles up as a fabric canopy for a deck on the second floor when you build the holiday home option. Another nice little touch was that when you build the Summer House you also get to build a little yellow jeep to park outside it. All in all this is a quality brick build set and we liked everything about it. We did found the Yacht a little disappointing but this was more than made up for by the detailed camper van and the beautiful holiday house. Another disappointment is that if we want to display both the camper van and the summer house we need to buy two sets! Also strange that there was no adult male mini-figure but this isn't a deal breaker. Is The Lego Creator Vacation Getaways Worth The Money? The retail price for this set is $69.99 but as you know, we have it for sale for less. The creator sets are probably Lego's most value packed as you are given the option to build three different models. For those that enjoy building brick sets rather than playing with them they are especially good value for money. Each year LEGO seem to make even more stunning sets than the last and we could end up spending a fortune on these beautiful brick built models. 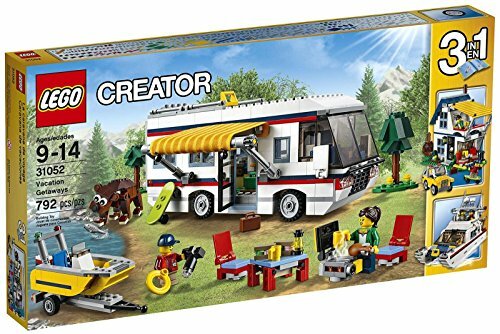 The creator sets are certainly some of the most value packed and this Lego Creator Vacation Getaways set has plenty to offer.